Description: This small fish grows to around 10cm in length. It is pinky brown in colour, with a distinctive dark spot near the middle of the base of the dorsal fin. 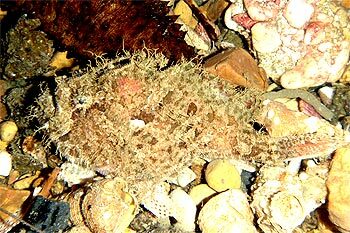 Ecology: The D’Entrecasteaux Anglerfish is so named for the modified first dorsal spine which acts as a lure to attract prey. This species feeds on small crustaceans and polychaete worms. Closely related to handfish, this anglerfish is also a specialised bottom dweller, using its pectoral fins to crawl along the sea floor. Interesting Facts: The D’Entrecasteaux Anglerfish does not have a gill cover like other bony fish, but possesses pore-like gill openings near the base of the pectoral fins.